Here are some pics from the opening night of the "On Deck" show at Foundation Gallery and Live Room in Kensington, Maryland on January 11. Gabe contributed two decks to the show which included over fifty entries. Thanks to Matt Corrado of Foundation for putting this event together! October's "First Friday" in Richmond ushered in the much-anticipated "Splinters" show at 212 West Broad Street. Glide Skateboards owner Brian Lopez teamed up with Richmond artist Hamilton Glass to showcase over sixty skateboard decks custom painted by regional artists. PONSHOP co-owner, Gabriel Pons, contributed several decks. 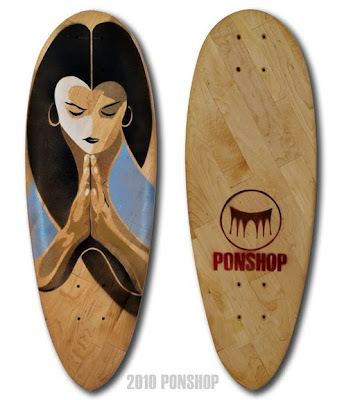 His "Glide" custom is titled "Her Way of Praying#1" (below). "Splinters" was sponsored in part by: Blueberry Delight, Art 180, Main Art Supply, and Spaghetti Project. The show included some friends of PONSHOP too: Toni Hitchcock, Icy Grape Incident, Jeff Gulick, Hamilton Glass, Sean Donlon, Jeremy Simmonds, and Robb Burch.